Guitar Hero World Tour is getting the Xbox Live Weekend treatment come November 27th, snagging the coveted Thanksgiving spot on Microsoft's service. They're planning on making good use of the four-day weekend as well, kicking things off with an all-nighter kicking off Thanksgiving Day, lasting from sunset to sun up, targeted at those of you who can somehow stave off the sleepy effects of consuming massive amounts of dead bird. Then on Friday the obligatory play and win sweepstakes starts, running throughout the weekend with prizes ranging from 1GB memory sticks to a Samsung home theater system. Finally, on Saturday the 30th from 10:00PM to 1:00AM GMT, players will be able to jam online with the folks from Neversoft, from the Producer on down to the QA testers. Hit the jump for the full list of Neversoft friends to add to your list, as well as more details on how you can participate in the weekend's festivities.SHRED, DRUM AND WAIL IN GUITAR HERO® WORLD TOUR LIVE WEEKEND ON XBOX LIVE® MARKETPLACE Prizes to be won in online sweepstakes. Game with the developers in Xbox Live exclusive Guitar Hero World Tour tournaments Wednesday 19th November/... Activision Publishing, Inc. (Nasdaq: ATVI) today announced an exclusive Xbox LIVE® online entertainment network weekend for their smash-hit Guitar Hero® World Tour. 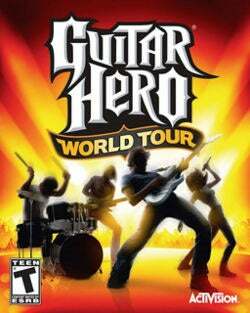 Starting November 27, 2008, players 14 years of age or older will be able to participate in a number of exciting online activities to determine who is truly the top Guitar Hero® rocker. These activities include: • Xbox All Nighter – Thursday, 11/27, from dusk until dawn • Play & Win Sweepstakes – Friday, 11/28, through Saturday, 11/30 • Game with Developers – Saturday, 11/30 from 10:00pm – 01:00am GMT Throughout the weekend, guitarist, drummers and vocalists who register and play the Guitar Hero World Tour multiplayer (co-op) session can also win special prizes, such as a Samsung television home theater package, collector’s edition Guitar Hero World Tour drum sticks, 1GB memory sticks and Guitar Hero portable USB/battery powered speakers. Highlighting the weekend’s activities, on Sunday, November 30 from 10:00pm – 01:00am GMT, virtual musicians will have the opportunity to prove their rock god skills online against none other than Neversoft Entertainment, the creators of Guitar Hero World Tour. For those up for the challenge, be on the look-out for the following development team Gamertags: • GHDevTina – Producer • GHDevLee – Associate Producer • GHDevCorey – Production Coordinator • GHDevAnthony – Midi Designer • GHDevChris – Midi Designer • GHDevJason – Lead Animator • GHDevZack – Junior Programmer • GHDevJosh – Jr. Sound Designer • GHDevKristina – Mocap Supervisor • GHDevJustin – Mocap Tech • GHDevAdry – QA Tester • GHDevBrandon – QA Tester • GHDevTravisR – QA Tester More details on registering for Guitar Hero World Tour Xbox LIVE weekend and information regarding terms, conditions, and official rules are available through the official event page: http://www.xbox.com/guitarheroworldtour. Open registration will begin when the site goes live and will end at 04:59am GMT on December 1st, 2008. The latest installment in the #1 best-selling video game franchise of 2007, Guitar Hero World Tour transforms music gaming by expanding Guitar Hero’s signature guitar gameplay into a cooperative band experience that combines the most advanced wireless controllers with new revolutionary online* and offline gameplay modes including Band Career and 8-player “Battle of the Bands,” which allows two full bands to compete head-to-head online for the first time ever. The game features a slick newly redesigned guitar controller, drum kit controller and a wired microphone, as well as an innovative Music Studio music creator that lets players compose, record, edit and share their own rock ‘n’ roll anthems. Music creators will also be able to share their recordings with their friends online through GHTunes where other gamers can download and play an endless supply of unique creations.